Rekha is among the few in the Bollywood firmament with an elusive star quality. Single, rich and beautiful, Rekha has baffled critics and fans alike with the air of mystery and intrigue surrounding her. V. Gangadhar attempts to unravel the enigma. Those in show biz, particularly women, pray to be endowed with good looks and talent. The really ambitious among them would give anything for another rare quality, an air of mystery and intrigue which adds up to the personality count. The touch of mystery is associated with class and transcends errors of judgment. Abroad, Greta Garbo had it and that was what kept her apart from the likes of Marilyn Monroe, Elizabeth Taylor and other glamour queens. Ingrid Bergman had it despite her controversial and "illegal" marriage to Italian director Roberto Rossellini. Grace Kelly acquired this status after her wedding to Prince Rainier of Monaco. From histrionics to sensuality and an enigmatic appeal of a diva to an air of mystery—Rekha seems to have it all. Winner of the Lifetime Achievement Award in the 50th Fimfare Awards, Rekha, like good wine, seems to have got better with the years. Neither time nor age has rubbed off the sheen from her star quality. Not only does she still continue to dazzle but has also displayed the tenacity to reinvent herself in step with times. The veteran was supposed to be a mentor to Mallika Sherawat but gave the latter a run for her oomph factor when she teamed up with her in Bachke Rehna Re. Putting all wannabe sizzling stars to shame, at 50 plus Rekha is all set to vow audiences in a sizzling item number in Vidhu Vinod Chopra’s Parineeta, which is set in the Kolkata of 1960s. Rekha plays a crooner in a nightclub called ‘Maulin Rouge.’ A die-hard Rekha fan, Chopra tested the queen bee for three days before okaying her for the item number. The Indian screen had its share of stars who possessed this elusive quality. Nargis was the "woman in white" but there was something mysterious about her mainly because of her relationship with Raj Kapoor. Meena Kumari, with her fondness for liquor, shairi and lusty young men acquired this quality. Madhubala with her unmatched beauty, unhappy domestic life, tragic romance with Dilip Kumar and untimely death at 36 could not escape this. Contrast these women with the Madhuris, Karishmas, Kareenas and Aishwariyas, who despite figuring in gossip columns everyday and in the Rs 50 lakh plus per film category do not evoke all that much interest. They are so predictable, in fact dull. These stars say the most predictable things and act in the same manner. After remaining in the limelight for six months, a year or two, they quietly fade away. Hindi cinema’s only woman of substance, of late who enthralled the audiences and others with that air of mystery and intrigue while remaining a top heroine for more than 10 years is Rekha, who turned 50 last October. She belongs to the category of women whom age cannot wither and whose infinite variety could not be staled by custom. 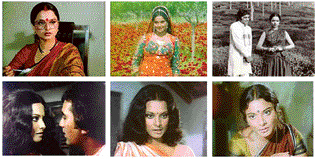 Bollywood had seen more beautiful women than Rekha and more talented actresses. But they were just stars, successful stars who had their day in the industry and then disappeared. None of them possessed the rare qualities of Rekha, a sort of icon worshipped by her fans. For more than a decade-and-a-half, she remained the top star of Bollywood, co-starring with all top heroes and handling memorable roles. Rekha bagged every available award, including the National Award and three Filmfare awards. She worked with all top directors, excelling in both straightforward and offbeat roles. "She was the most versatile star of her generation," observed veteran director Hrishikesh Mukherjee. "And unmatched in handling comic roles." She starred in nearly 20 films with the top star of her era, Amitabh Bachchan and their names continued to be linked romantically giving grist to the gossip press. A sizeable crowd gathered in front of a small bungalow at Bandstand in Bandra in Mumbai every morning to see Rekha emerge out of nearby Hotel Sea Rock where she went for workouts. The crowds quietly dispersed after having the darshan of the star. Today the hotel has gone out of business and Rekha, perhaps, had installed a gym at home. This was star quality which Rekha shared with Amitabh Bachchan. Rekha’s story is a mix of two fairytales, one of rags to riches and the other of the ugly duckling turning into a swan. Not much is mentioned of her early days, but life, though not made up of rags, was certainly not easy. She was of film pedigree, father Gemini Ganesan and mother Pushpavalli, were stars in Tamil cinema. The marriage collapsed, the father remarried again and again, Pushpavalli and the children came to Bombay. 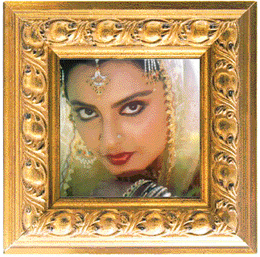 Rekha, in her occasional TV and print media interviews, seldom discussed her early days. While declaring that she was close to her father, she also admitted that Ganesan never visited the family in Bombay. Ask her what she missed most in the city. "Going to school, wearing uniform, doing homework and being like any other child," she once said. That was not to be. Expected to be the sole breadwinner of the family at the age of 13, Rekha had to haunt the sets of film studios in Bombay for work. The dark, plump, overdeveloped girl was pitch-forked to the heroine’s role opposite Navin Nischol in Sawan Badhon which became a hit. In a two-part TV interview with Simi Grewal some months back, Rekha spoke lightly of her earlier days in Bollywood, but life certainly was not easy. "The scars often show even today," explained her close friend, and one-time co-star, Rakesh Roshan. "You can imagine the life all alone, desperately hunting for work, and pursued by Bollywood wolves." Having starred in a hit, work was not difficult to come by. But the media featured garish stories about the actress, snide comments by both male and female co-stars. ‘Chalu’, ‘maal’ were some of the epithets hurled at her. Sometimes even by her heroes. Because of her ‘heroine’ status at such a young age, Bollywood was a whirl for Rekha. She dressed badly, did not know how to use make up, was fluent neither in Hindi nor English, had the wrong kind of friends and made the media headlines for the wrong reasons. Some of the stories about her were bizarre. Labelled a man-eater, Rekha was reported to have married fellow actor, Vinod Mehra and then attempted suicide by swallowing contaminated ‘upma’. What was the source of contamination? A dead cockroach. Finally, the process of cleaning and cutting the uncut diamond began. Rekha of the 1980s turned out to be different from the Rekha from the 1970s. There had been no doubts about her ability as an actor, she had delivered hit after hit. Umrao Jaan and Khubsoorat, both 1981 releases, produced a new Rekha. Poised, well groomed and brilliant. Umrao Jaan, the story of a Lucknow court singer which saw a radiant Rekha lingered in one’s mind. Recalled co-star, Farooque Shaikh, "She was just awesome, it was a privilege to act with her." This was the period when the ugly duckling emerged as the graceful swan. This was also the peak period of the Rekha-Amitabh starrers. There were rumours that he advised her how to dress up, put on make up, what to read and what kind of roles to accept. According to other reports, Rekha learnt to do her own make up, after completing a course in London and began to favour the oily, dusky kind of make up, not the dry one favoured by most Indian stars. She began to dress in the most exquisite Conjeevaram silks and chiffon sarees which she bought in hundreds. Her hair was often done in the conservative fashion, a long plait and had lots of flowers. The result was an eye-catching, magnificent looking woman, who stole the show from everyone else present. Her elusive air deepened when her name was associated with Amitabh Bachchan. In all media interviews, Amitabh Bachchan politely referred to Rekha as a talented co-star and nothing more. The ‘romance’ was all in the minds of gossip writers, he claimed. Rekha would neither confirm nor deny the romance. She had also developed the ability to say the simplest of things in the most complex manner. We all expected her to come out with some startling facts in the interview with Simi. But it was of no use. Replying to each and every gushing question from Simi, Rekha arched her eyebrows, sighed, talked of philosophy, referred to Amitabh as a legend and God, fluttered her eyelashes and tried to discuss man-woman-God relationships. Simi had to give up. Much to everyone’s surprise, Rekha also denied having married Vinod Mehra. There was also another puzzle in her life, the "arranged" marriage to Delhi industrialist, Mukesh Agarwal, who some months after the wedding committed suicide by hanging himself with Rekha’s dupatta. Simi raised the issue in her interview in a very sympathetic manner, and once again did not get any definite reply. There is always an aura of mystery about a single, rich, beautiful woman who lived alone. The Indian media had never intruded too much into the personal lives of people and Rekha was no exception. At the same time, Rekha did not shun public life. Unlike Greta Garbo, who was seldom seen in public, Rekha attended every important party and function, and was the star of the show. Amitabh Bachchan was also present in all these shows, but the couple always sat far apart. If at all, they came face to face, it was just a polite namaste. The ‘brat’ of the 1970s had indeed changed a lot. Rekha was now more selective in her roles. She was aggressively feminist in Khoon Bhari maang which fetched her a Filmfare award for acting. Keen to accept different types of roles, she played a teacher in Kama Sutra, a bored housewife in Astitva and important character roles in Bhoot and Koi Mil Gaya. "Rekha is a rare gem," said director Mahesh Bhatt, "if only I had a suitable script for her, I would cast her without any delay". Yash Chopra, another leading producer director, sighs "Such talent". "Rekha should go on acting as long as she can". Knowing her, Rekha would laugh heartily at being labelled a legend. "I am not as old as that," she would protest. But for the industry and her fans, she is a legend. Many young actors, who went to her for advice, found her warm and helpful. Living with her hair dresser-turned-secretary, Farzana in her Bandstand bungalow, along with pet cats and dogs, Rekha is content, having fulfilled her family obligations, helping her brothers and sisters get settled in life. She also made up with her father. Rekha will continue to accept interesting roles when they were offered. She regularly practises yoga and for years had avoided fried and heavy food, but drinks several glasses of water everyday. Though Rekha describes herself as a bathroom singer, these days she occasionally sings while doing shows with other stars abroad, and even sang in films like Khoobsurat. Her occasional blue moods vanish as she watches, the hilarious Kishore Kumar —Sunil Dutt — Saira Banu starrer Padosan or listens to the music of Bryan Adams, Sting, Whitney Houston and Barbara Streisend. The mainstream media front-paged her reaching 50. But Rekha seldom thinks about age or getting old. She lives for the present. She thinks of children and would have loved to have a son like Hrithik Roshan, her screen son in Koi Mil Gaya.